WhatsApp UPI-Based Payments Spotted In Beta - Final Rollout Soon! WhatsApp's popularity is expected to give a bigger boost to digital payments and cashless transactions in India. WhatsApp had announced its integrated UPI based payments service back in 2017 and has been working on the digital payments feature since the past year. The Facebook-owned social messaging company has finally made the feature live to select beta users. It was recently spotted in beta on the internet. The WhatsApp payments service will be launched initially in India and will roll out in other countries in a phased manner. The feature is in the final stage of integration. It will link your UPI account and then the payments service can work seamlessly from WhatsApp. 1 How Does WhatsApp UPI-Based Payments Feature Work? How Does WhatsApp UPI-Based Payments Feature Work? Currently available for a select few beta users, the payments service has been made available in the chat window within the Attachments menu. Users can select their bank account by tapping the Payments option. Once you follow and complete the instructions, your bank account should be connected to Unified Payments Interface (UPI) platform. The feature works like any other UPI-based payments apps like Google Tez or Flipkart PhonePe. Users need to verify their mobile number to add their bank account details and to be able to use the payments feature on Whatsapp. As per the early reports, the feature has been reported to be “intuitive, simple and very similar to using any other feature on WhatsApp, like sending a picture or location or video”. The payments feature will be integrated into the online chat app and will surely make payments easier for over 200 million monthly active users in the country and will allow users to transfer funds without exiting the app. The feature in India will be indicated by the Rupee Symbol in the attachments window, alongside other options which include the gallery, location, contact where users will be able to send or request money. WhatsApp is immensely popular in India, even more than Facebook. India has a WhatsApp user base of more than 200 million daily active users. India surpassed the US last year in total time spent using mobile apps per month. With the recent focus on cashless payments, transferring money digitally will be very useful for local merchants as well as customers. WhatsApp being a popular option among the masses, users can seamlessly transfer funds among themselves. The Facebook-owned app has also signed up a number of Indian banks to help the company bolster its payments service in the country. Whatsapp has also integrated UPI into its payment system, which will allow instant transfers between participating banks without any hassles. The addition of the Payments service will put WhatsApp into the competition with other social texting services which already support the UPI based payments like Tez from Google, Tencent-backed Hike and even India’s largest digital payments wallet platform Paytm, which recently expanded into messaging by launching Paytm Inbox in order to take on WhatsApp more directly. But with the huge base of active users in hand, WhatsApp will have an added advantage over others. The potential for WhatsApp to dominate in the Indian P2P payments market is very strong, given its millions of users, and thanks to recent lower-cost data plans and cheap smartphones. Once WhatsApp Payments go live, it will be one of the easiest options for people to go cashless, and to send and receive money. Last month, WhatsApp has also launched its business app, WhatsApp Business, globally (including India) which features business profiles, quick replies to FAQs and messaging statistics among other things. WhatsApp Payments will be a convenient feature for millions of people in India, which will save you from the hassles of exchanging your bank details with other people. 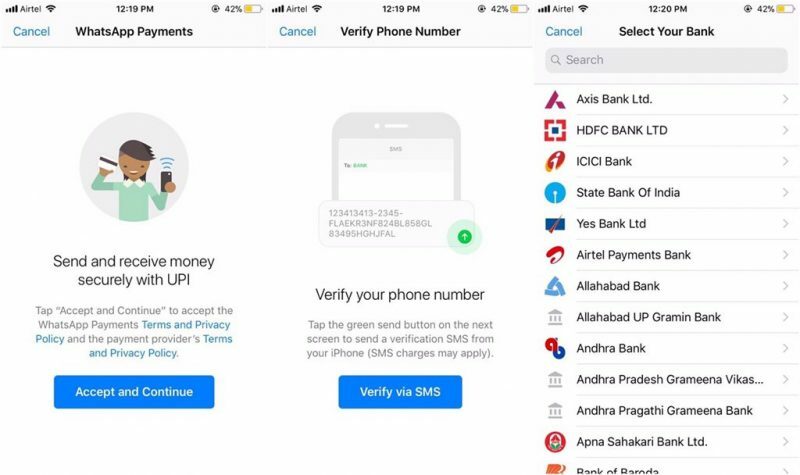 "WhatsApp UPI-Based Payments Spotted In Beta - Final Rollout Soon! ", 3 out of 5 based on 4 ratings.